Before I started following him on Twitter, here's what I knew about Rahul Khanna. In a resumé that is modest in size by Bollywood standards, he had attended a film and theater program in New York whose alumni roster includes many other names you know, won a Filmfare Award, and worked with people as diverse as Imtiaz Ali, Deepha Mehta, Konkona Sen Sharma, and Mithun. He spoke up for animals, blogged a bit, and, wherever he appeared, looked completely at home in a suit. And then, thanks to his incredibly real-sounding and personality-filled tweets, we filmi fans learned a little more: the foibles of his family's pets, his admirable balance of yoga with chocolate, his interest in art and literature...and, Helen above, the man can write. In a sea of celebrity tweets full of SMS spellings, extraneous exclamation marks, and vapid retweets and project promotion, here was someone who communicates real thought and character and likes talking with fans. From the moment he first sent me a direct message—a response to my enthusiastic support of his love for his espresso machine—I wanted to find out more about why he uses Twitter so differently than other actors. This fall he graciously talked with me about his use of and thoughts on Twitter. His replies were full of his usual thoughtful content and charm—happily unfettered by 140 characters and spaces. Beth: First thing's first: tell me about your profile description “boutique Bollywood actor.” Whenever I tell other film-loving friends about that, they clap with glee about how perfect that is. Heck, even my American friends and colleagues who don't know anything about Hindi films think it's delightful. Rahul Khanna: It was born out of necessity. When I meet new people (mostly outside of India) and they learn I’m an actor in the Indian film industry they always go, “Oh, so you must do 5-10 films a year”. It’s often tedious trying to explain the esoteric space I occupy in such a prolific industry. I had been hearing the term “boutique” used to describe everything from hotels to investment companies that were more niche and realised it was also quite apt for me. I decided to try using it and found it always got my point across plus got a good laugh. Just the other day, Frieda Pinto and I were discussing films while cooling our heels in the airport lounge on our way to the Goa film festival and when I mentioned it to her, she burst into giggles. Follow-up questions that aren't really about Twitter but I think readers would love to know about. You've had a really good string of roles that I think are evoked nicely by the term “boutique”—Dil Kabaddi, Love Aaj Kal, Wake Up Sid. In two of them you get to be the dashing, smart, deserving, almost perfect option that people overlook...I hope that's autobiographical neither to personal life nor to career! Hmmm, I hadn’t thought of that but now that you mention it…. Your character in Wake Up Sid, though, treads very close to being insufferable, albeit in a realistic, “ohhhh, I know that guy” way. What was it like to play a suave villain who—gasp!—prefers jazz to vintage Hindi film music? I find villains very interesting. Especially the particularly stylish ones like Hannibal Lechter, Tom Ripley, Gordon Gekko, Keyzer Soze and even Eric Northman, to name a few. I would love to play one some day. That said, I didn’t see the Wake Up Sid character as a villain at all. He was just someone who was very sure of himself and his likes and dislikes. Perhaps some of his perceived villainess came from the way he made Konkona’s character feel about herself. (Which was, in fact, the same way she had earlier made Sid’s character feel about himself.) When Karan (Johar) and Ayan (Mukherji) were discussing the character with me, Karan said, “He should be the kind of person you feel is always slightly judging you. So, just be yourself!” That was a bit worrying. I've un-followed so many Hindi film actors because they never say anything relevant, engaging, or even intelligible, whereas you write like the other calm, self-effacing, humor-possessing, language-loving people I follow on Twitter. Is your tweeting style simply a brief, typed expression of how you generally talk and/or present yourself, or are there other factors that shape how you tweet? Has your experience as a host/emcee for various outlets and events given you a certain ease and fluency in speaking publicly? Thank you for your kind words. Some people’s tweets make me cringe, too. But that’s mainly because I hate abbreviations and bad spellings. Yet, most of those people have many more followers than me, so it’s all about personal preferences. The way I choose to tweet is definitely an extension of how I generally communicate. Even when I send text messages, I always type out full sentences with correct capitalization and punctuations. My friends often complain they need a dictionary to understand my SMSes but, although I like words, I’m not a man of many of them so I find great comfort in the brevity that Twitter enforces. I don’t tweet very often but I try and come up with at least one tweet a day (although, sometimes, even that is difficult). I also put a fair bit of effort into each tweet in terms of spell, grammar and fact checking. In spite of which, about 80% of the time, after posting, I think of a better way of saying something and wish I could go back and edit it. My worst Twitter nightmare is realising too late that I’ve posted a tweet with an incorrect spelling or a missing apostrophe. Do you spend much mental energy trying to place yourself a certain way within the film or entertainment industries via Twitter? Your tweets are so charmingly different from everybody else's, and I wonder if the resources you've put into using Twitter have been productive for you? I haven’t consciously tried to position myself in a certain way. I just make an effort to try and tweet in the same tone I would chat with friends and family on an instant messenger service. I can always tell when a PR person is tweeting for a celebrity and that often puts me off and is the reason I don’t follow many people I otherwise find interesting. It’s important to me that the people who have made the effort to follow me know it’s actually me typing those 140 characters. 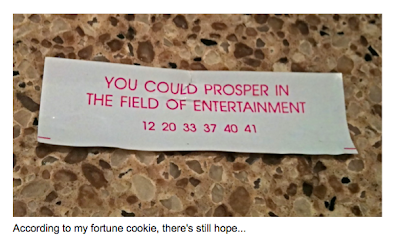 On that topic, your fortune cookie tweet awhile ago was a little poignant. http://twitpic.com/2j9ydk What projects would you like to be working on that you aren't currently or haven't done so far? What would you most love to be working on? Well, I really love working so I’d love to be working constantly on projects that excite me and I believe in. If you are using Twitter to try to cultivate an audience, or a particular kind of audience, has the attempt been successful? It hasn’t been so much about cultivating an audience as much as it has been about establishing an online presence. I needed a place where people who were interested in me could find out more about me and interact with me and where I could disseminate news. I don’t have my website up and running yet and I find Facebook too fussy, so Twitter was the natural choice and has served the purpose beautifully. This interview is testament to that. What about the social and community-building aspects of Twitter? I'm amazed by the number of people I've met and really gotten to know through it. I suppose as a celebrity you have to be more careful than the rest of us about jumping into discussions, even if they're just about news or recent film releases. Are there things you feel you can't or shouldn't do on Twitter that you wish you could? The other day I was in an elevator and this gentleman suddenly turned to me and handed me a toffee just before getting off on his floor. He wasn’t looking to engage in conversation or anything and I barely had time to mumble a thank you before the doors closed. That’s kind of what I want my tweets to be—an unexpected, sometimes irreverent, possibly eccentric and hopefully pleasant offering. I try and keep them as lighthearted and fun as possible. I want people to look forward to reading them and I would never post anything inappropriate or mean-spirited on my page. I am quite private by nature so, I’m not really comfortable giving out my location, blow-by-blow details of my day, offering lofty opinions or participating in public discussions, although I do enjoy following some of those…. Are there any tweets that you think really pinpoint your personality or sense of humor? 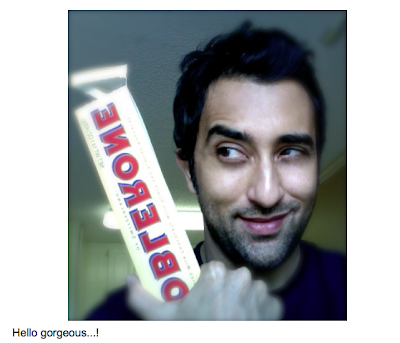 One of my favorites is the “Hello gorgeous” Toblerone picture with opened wrapper and raised eyebrow. http://twitpic.com/wvbut It says so much in just two words and one image! Not only is loving one's chocolate totally relatable, as is the idea of an actor who tweets about yoga also mentioning his sugary companions, but there are layers of potential meaning, too: who's the gorgeous one, who's the chocolate hero, etc. Ha ha ha… There are a few I look back on and chuckle at, mainly because of the absurdity of the situation that inspired them. The one about the workmen on the scaffolding outside my bathroom, the one about the shaving bloodshed, the Federer tennis swing, the flatulent co-passenger… check my favourites. It's probably not a surprise to you that there's a merry band of us who squeal (sometimes silently, sometimes not) whenever you send us a direct message after we've replied to one of your tweets. Do you have a particular approach to responding to fans' comments? Do you get many ear-piercing, exclamation-mark-filled tweets directed at you...or other types of responses that are hard to deal with? I’m amazed that people are even interested in what I have to say, so getting positive responses to my tweets is like icing on the cake. Unless I feel it would be of interest to others, I generally reply via direct message because I think it’s more personal and also so that if someone wants to read through my tweets on my main page, they don’t have to sort through a clutter of replies. Are there any people in the Indian entertainment industry who aren't on Twitter but you wish were? If I could pick anyone, I think it'd be Prayag Raj—you know he would still come up with wild rides and magnificent irony in only 140 characters. Ironically, some of the most interesting personalities today are actually quite dull on Twitter. If Rumi were alive today, I think he’d be wonderful on Twitter. The same for Harivanshrai Bachchan. Oscar Wilde, too. I also see Twitter feeds as micro-memoirs. Imagine having daily updates from Gandhi or Moses or Da Vinci or Chaplin. From the contemporary Bollywood world, I think the one person missing from Twitter who might be a hoot is Rekha. I notice you follow dictionary.com and Advice to Writers and never use SMS-style vocabulary—and recently you mentioned re-reading Love in the Time of Cholera. Are you in fact a word nerd? Guilty as charged. I really like words. The bigger the better. Like a trophy-wife, I don’t always understand them but I like the way they look and sound. I’m superficial that way. The downside is, I get a lot of “I can’t understand a word you’re saying. Why can’t you tweet in normal English?” messages from followers. I have no idea if you think of yourself as a writer, but your well-constructed tweets indicate that you like putting words together, and you clearly have many fans who love what you do with words. Do you have any plans for more formal writing projects? Twitter has certainly opened up the door to that world, if only a crack. After reading my tweets, Vogue commissioned me to write a piece for their January ‘11 issue and www.bpbweekend.com asked me to write a foreword for one of the sections of their new ‘Guide to Secret Mumbai’ book which will be out in February. Apart from that there have been a few other writing offers, too. Let’s see where the road leads. Have you seen the Mahabharata in tweet form? I think the idea of breaking revered works down into tweets is an interesting response to the common perception (particularly held by people who don't actually use Twitter) that Twitter is necessarily lightweight, silly, and fleeting...not to mention an amazing intellectual challenge to pull off. If I had an assignment to try that, I'd do A Suitable Boy. Not only is it one of my very favorite novels, but the big cast of characters and all their conversations in different locations could be evoked pretty well with Twitter, I think. What do you think are some of the most interesting uses (in practice or potential) of Twitter? That’s a great idea, actually. Maybe some of the other classics broken down into tweets. Twitter Cliff Notes, if you will. Maybe even quick lessons in film history or art history. What a delightful interview you've done here. You asked great questions and Mr. Khanna was predictably charming, innit? When, where, and how did you get the chance to speak with him this fall? Does Mr. Khanna hang out in some coffee shop or bookstore you frequent and you just started to interview him? Thanks for posting this, as it allows me to continue to dream of my fantasy Rahul Khanna, who I can touch through 140 characters, or less. What a splendid way to start the new year. Two of my favorite people in one delightful conversation. By the way both of you challenge me to improve my written English every time I read a tweet of yours and make me blush in shame whenever one of those dreaded apostrophes finds itself somewhere in my tweets where it should not be. I really think I like Rahul as a person, and I agree that he would be a great writer to read. The interview was almost as fun to read as it must have been for you to do- brilliant! Rahul seems like such the old-world gentleman. I love his tweets and I love this interview. ;-). If only all Hindi films were so well thought out. KJo certainly seemed to know exactly who that character was and that forethought coupled with Rahul's talent and charming screen presence turned out brilliantly in the finished product. Once again, brava for a terrific interview and a lovely blog post to start the New Year. Gah! A typo in my comment! What will Rahul think? I'm so ashamed. Beth - I think this is the best interview I've ever read. Seriously! NEW CAREER! And though I wasn't previously, now because of this interview, I'm going to follow him on Twitter! Enjoyed reading the comments as much as the interview. You are loved for the right reasons Rahul Khanna! Beth, What a great interview. You asked some really interesting questions and the interview just flows like a good conversation. Both Rahul Khanna and you have convinced me to take Twitter seriously now. At least read. So thanks for some good leads. Have a happy, rollicking new year. I love the fact, that Mr. R. Khanna hates abbreviated, shortened, mutiliated english words on twitter. It's apparently a style among some group of people, notable indian movie stars included, to chop down mercilessly perfectly good english words..even when the character allotment of 140 words are not totally used up. Apparently they have not caught up, and still fervently strive to make their chats, emails, sms'es and twits as early 200 AOL style retarded as possible. The fact that it infuriates me and others, is an understatement. I fully empthasize with Rahul's frustration in this matter. Another thing, this guy, aka Rahul, is too damn intelligent and well read and bordering on an educated intellectual being to be a successful actor in the Bollywood film industry. I pretty much said as much in my tweet to him. Unfortunately, I had to go half-retard and abbreviate to conform to the 140 character limit. My apologies about that. His fate remains in the same plateue (spell check needed) as Nasiruddin Shah or something. Due to the extreme competitive nature of Bollywood, only the actors who bluntly thinks and nosedives, catering to the base mediocrity of general Indian public and their demands of what they see in an actor, are successful. There are plenty exceptions to this norm though. And they're successful. But they're successful now. They built their careers, appealing to the nuances of public demands, before they were able to establish their own rigid moral forms, which then the public acceded to, and accept. It's rarely the other way around. In Bollywood, you've to sell yourself short first, bare your own true self hypothetically and completely naked to the finicky moods of public first, and achieve success, before you regain your composure and your true self and force the public to accept your righteous form, which you yourself believe. Enough crappy and irrelevant commenting for one day. Later. By the way, I went through your blogs, not just this article, and I love it. Very good journalism, I hope you'd keep it up. And as for you, Mr. Rahul Khanna, I have appreciated your acting for a long time. I certainly and fervently wish, that you get the opportunities in this coming year to prove your mettle. You certainly deserve the accolades, which has yet to be meted out to you. enjoyed reading that immensely ! Its a shame that Bollywood magazines interview the same inane, boring celebs over and over becuase the (far too) few interviews I've seen with Rahul are always fabulous!! And thanks for this Beth!! Thank you so much for such a delightful, fun and intellectually stimulating interview with one of my most respected actors in Hindi film industry today. Thank you so much and I hope to keep interacting with Mr. Khanna as always. P.S. Rahul I hate abbreviations too but then sometimes 140 characters aren't enough. That was delightful! I confess Rahul Khanna hadn't been on my radar before, but you've put him squarely in the middle now, Beth. And you've reminded me that a conversation can be art as well when you have such articulate interviewer and interviewees as you and Rahul Khannna. Happy New Year Beth! Thanks for this really interesting and wonderful interview with Rahul Khanna. As you know, I am a fan of all the three khannas - dad Vinod and sons Rahul & Askhay.It is a real treat for me as I am not a twitter or face book person. I am glad that Rahul Khanna and I and a few others are in the same league ie dislike of abbreviations and sms kind of language. Great interview, Beth. I appreciate that your questions had depth and background, and I appreciate Mr. Khanna took the time to respond thoughtfully. a)OMG, Rahul Khanna and I use the same toothpaste! b) Tom's of Maine is also featured prominently in "Stuff that White People Like" (http://stuffwhitepeoplelike.com/2010/12/15/six-gifts-to-guarantee-a-white-christmas/), so congrats to R Khanna on liking stuff that White People Like. I follow Rahul's Twitter and I don't even have Twitter. That's how awesome he is. How great that you got the opportunity to interview him... It's pretty different than reading a mag interview. What a great interview, and so much fun to learn more about Rahul Khanna. Do more interviews, please. Rahul Khanna is so articulate, self-deprecating, funny, literate (not to mention good-looking)--why doesn't his character always get the girl? Great interview, Beth. I especially liked the way you unpacked, as it were, the "Hello gorgeous...!" image.